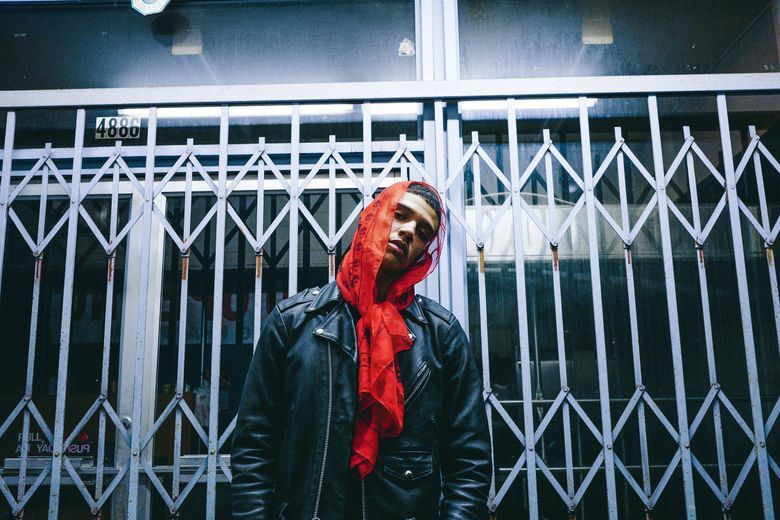 Rapper to hold record-release show March 8 at the Barboza. Porter Ray relaxes in an office chair in the living room of his Beacon Hill house/recording studio on a gloomy Sunday afternoon. The space is small but comfortable, with a computer workstation and a tiny closet converted into a recording booth, where Porter said the bulk of his Sub Pop debut “Watercolor” — out Friday, March 10, with a release show at the Barboza on Wednesday, March 8 — was created. Besides the essential furniture — couch and coffee table — there’s not much else in the space except stacks of books everywhere. There’s a dictionary, Lois Lowry’s “The Giver,” two copies of “The Autobiography of Malcolm X,” and assorted writings from the likes of Chomsky and Machiavelli. There’s also about eight composition notebooks full of handwritten rhymes, with six blanks stashed under the coffee table. 8 p.m. Wednesday, March 8, the Barboza, 925 E. Pike St., Seattle; $10 (206-709-9442 or thebarboza.com). “Watercolor,” he added, is full of material the Seattle native saved specifically for his official debut. “I wanted to take things I touched on with [my first mixtape] ‘BLK GLD,’ personal things I’ve touched on throughout my music, and then go in depth,” he said. Though Porter’s been rapping for most of his life (“just freestyling at parties, random cyphers on [Capitol] Hill and stuff like that”), he hadn’t released anything until his 2013 three-part mixtape series “BLK GLD,” “WHT GLD” and “RSE GLD.” The releases, which unveiled his golden-voiced, old-school lyricism and storytelling over soulful boom-bap production, were the products of Porter immersing himself in music in the years following a difficult 2009 that left him without his younger brother and without a job — only four years after losing his father. “Watercolor” culminates as a vulnerable, personal, cohesive record that Porter said he wanted to sound more like “The Miseducation of Lauryn Hill” than a typical rap album. It’s completely original, with no samples, and live instrumentation from a slightly expanded but still close-knit inner circle of local artists he grew up with or met through mutual friends. The hazy, textured sounds land between the ’90s-steeped traditionalism of his “GLD” mixtapes and his left-field electronic crossover project “Electric Rain” with producer TeleFresco, but it’s distinctly Seattle to the core.